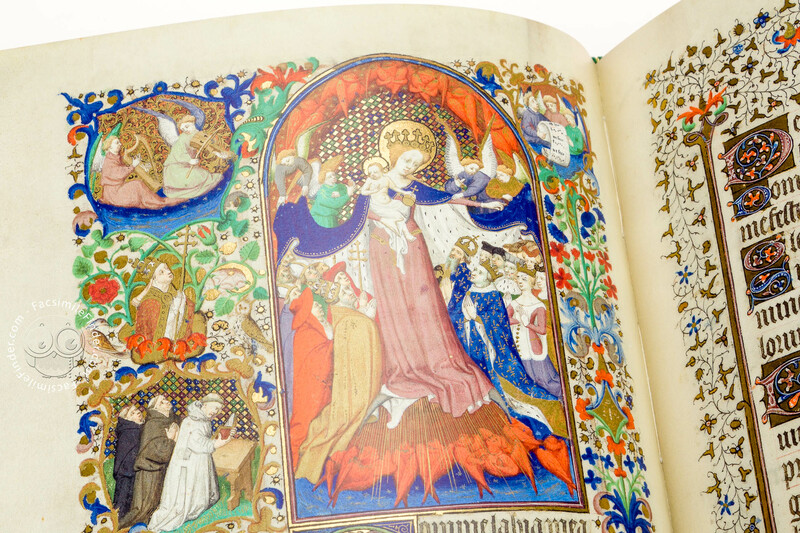 The Bedford Hours represent an invaluable example of aristocratic bibliophily in the history of illumination. 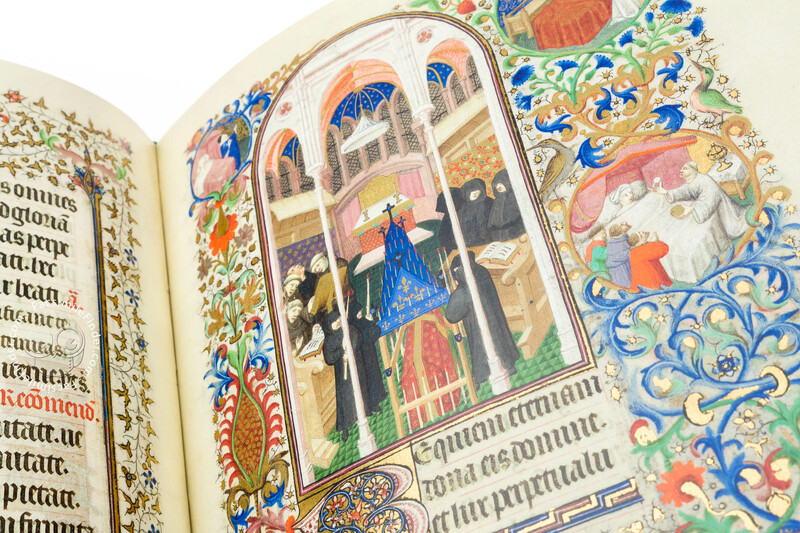 One of the richest Books of Hours ever to have left an illuminator's workshop, it became famous all over the world. 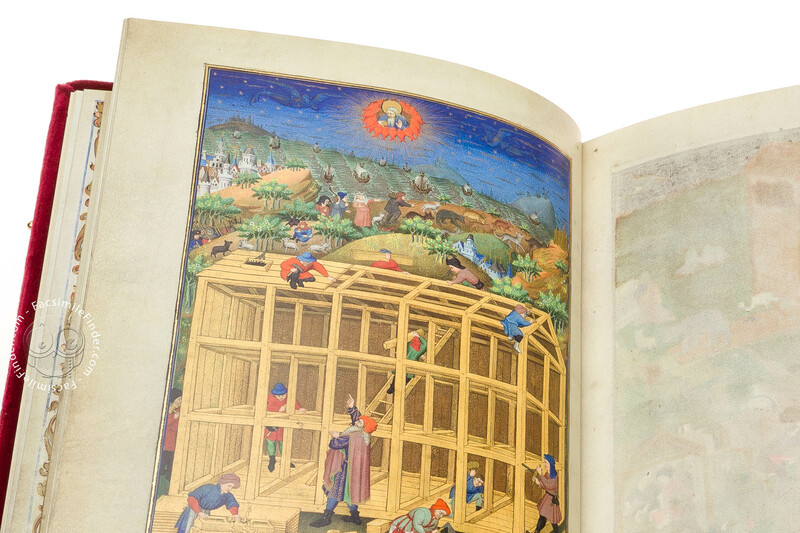 Miniatures from the Bedford Hours, such as the Ark of Noah or the Creation, are among the most frequently represented examples of the creativity which marked the first decades of the 15th century. It was the heyday of Gothic illumination, with new ideas of Flemish realism already visible on the horizon. With their 578 pages in the format 26.3 x 18.4 cm, the Bedford Hours constitute an unusually extensive painted manuscript. 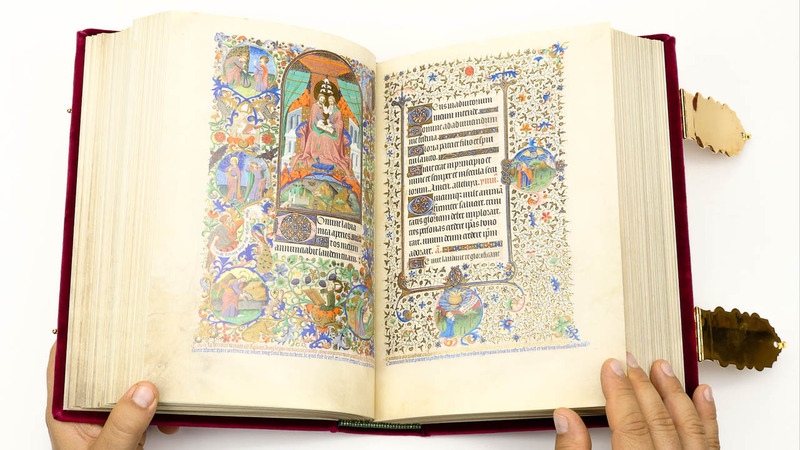 With 1250 elaborate medallions, 38 large format miniatures, all decorated with gold leaf, brush gold and frequently also with silver, different owners' arms and three historiated initials, the Bedford Hours unfold in splendour, making them one of the most precious manuscripts of their time. Every single page is illustrated! This magnificence is further enhanced by splendid scrollwork, with hundreds of tiny golden vine or acanthus leaves, colourful flowers and small animals covering the pages. 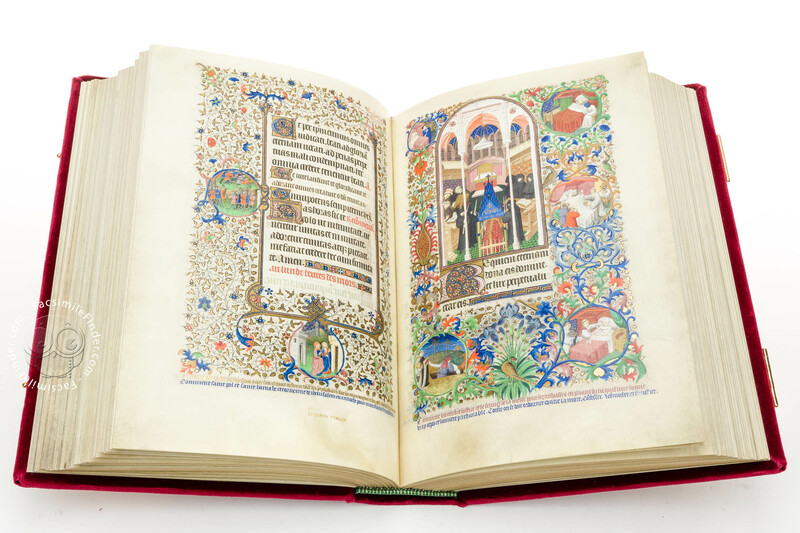 The Latin text is embellished with numerous gold initials and imaginative line-fillers, while French explanations of the miniatures appear in red, blue, and gold writing at the bottom of each page. 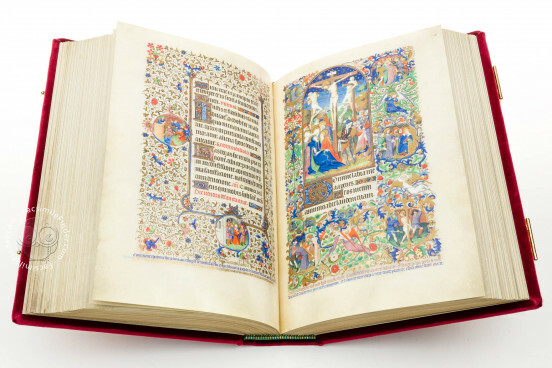 The Bedford Hours are today preserved in London, as one of the most magnificent art treasures of the British Library, and stand out among its manuscripts, a work of ultimate luxury. 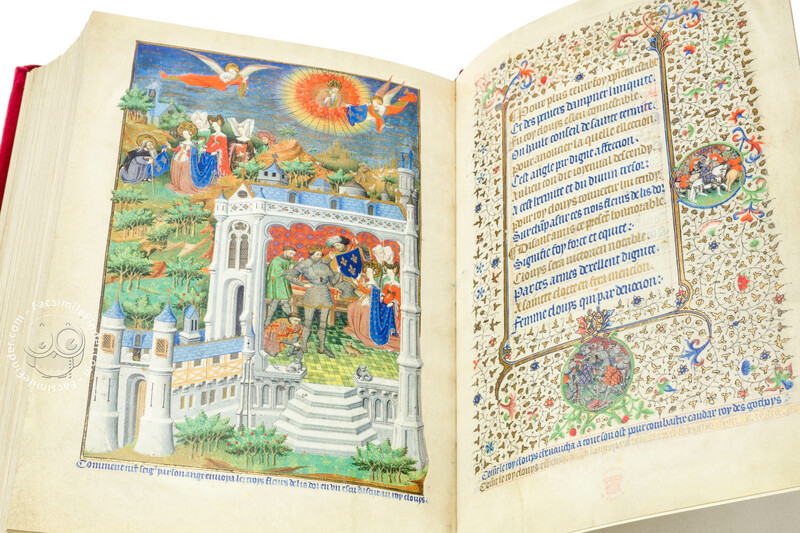 The Bedford Hours rank among the prime achievements of late Gothic Parisian illumination. They were entirely made by the ingenious Bedford Master who painted most of the miniatures himself and gave clear instructions to his helpers for the others. Although the artist of the Bedford Hours was among the leading and most prolific painters of his day, his identity has surprisingly remained a mystery. 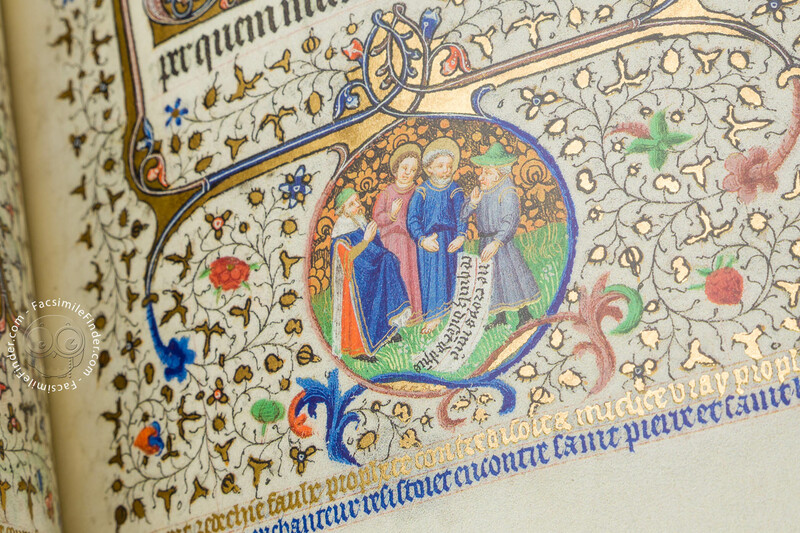 His nickname goes back to the Duke of England who has long been thought to have commissioned the work: John of Lancaster (1389-1435), Duke of Bedford and younger brother of the English king Henry V.
The illuminator of the Book of Hours thus entered art history under the title of Bedford Master, a name synonymous with high quality painting and luxurious opulence in books. From c. 1410 onwards, this talented painter remained one of the greatest illuminators in Europe for more than a quarter of a century. 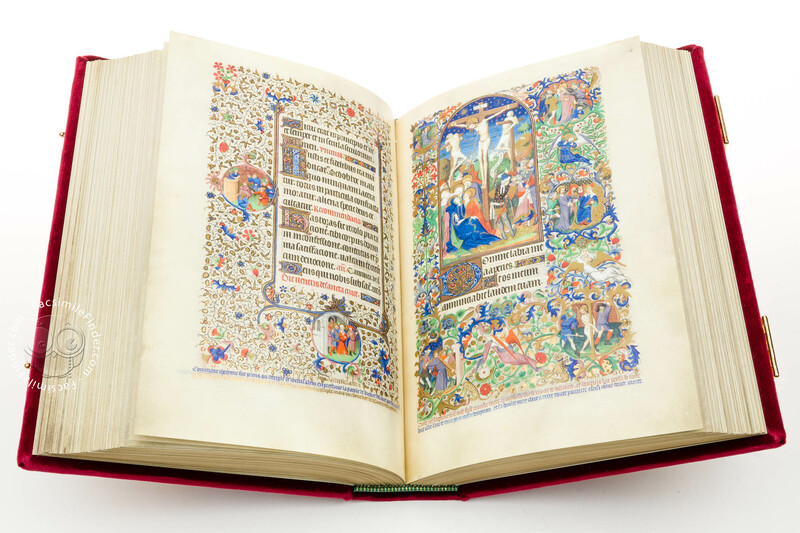 Although inspired by the genius of the Limbourg brothers, he enriched their work by adding countless new elements. And he set great store by the exchange with other workshops. E.g. 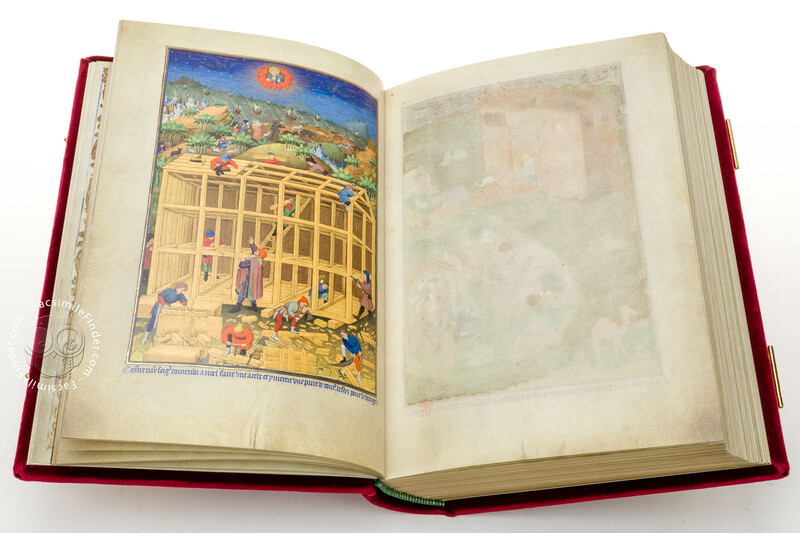 the Book of Wonders containing Marco Polo's travel account was the result of a close cooperation between the Bedford Master and the Boucicaut Master. Even today, we can still feel the artist's love of nature and his marked sense of observation, if not curiousness about the world around him. Despite a number of purely decorative elements, we are above all fascinated by his sense of perspective, of expansive landscapes and architectural contexts, an intuition that foreshadows the art of a then still distant future. The Bedford Master is also famous for the elaborate depiction of figures – small masterpieces of portrait painting. Their vestments with their softly swinging drapery folds as well as their faces display a strong three-dimensional quality. The brush of his stroke lends the figures different facial expressions. 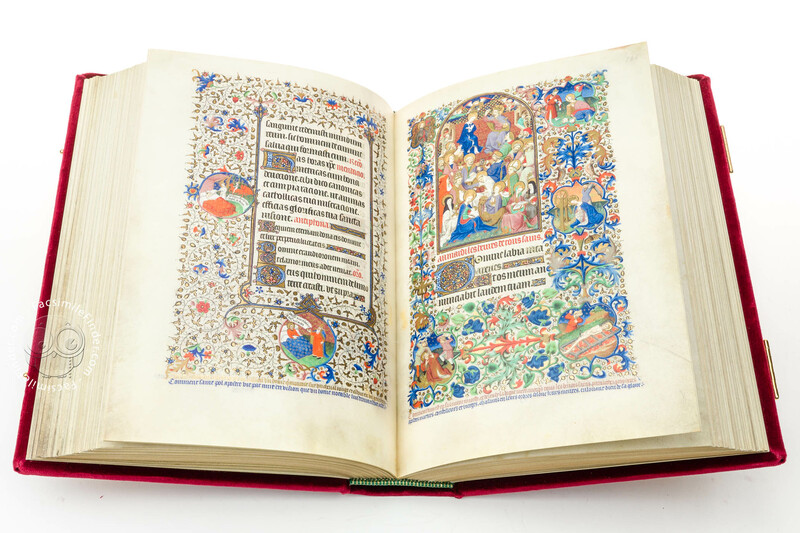 The Bedford Hours were made at a time when France and England had been waging war for some decades; and it was the Duke of Bedford who then, in alliance with Burgundy, successfully fought the cause of the English: the accession to the French Crown. It was this man who conquered half of France and eventually stopped the troops of Joan of Arc. He also married Anne of Burgundy, the daughter of Duke John the Fearless, thus gaining access to the art-loving Burgundian aristocracy, and ordered numerous luxuriously illustrated manuscripts himself. 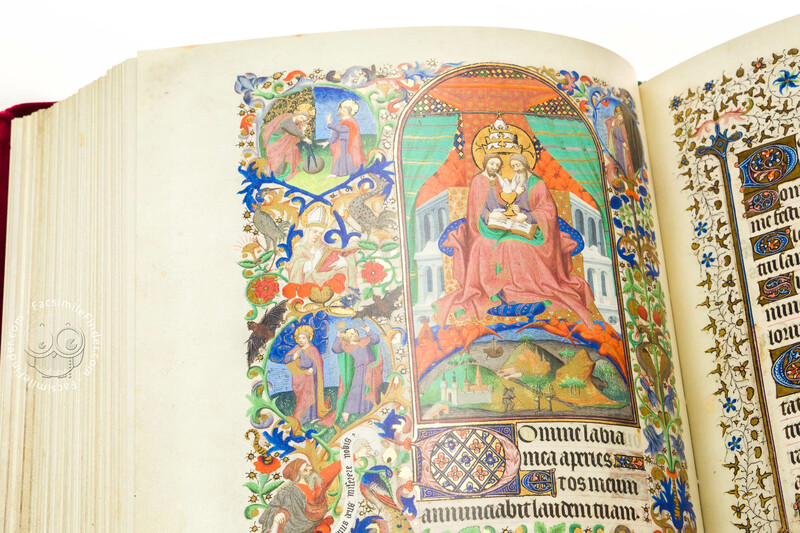 Anne must have received the Bedford Hours as a precious wedding gift from her brother Philip who had inherited it from his father John the Fearless, the initial patron of the book. This marriage of convenience between the Duke of Bedford and Anne of Burgundy soon turned into a great love. In the end, after Anne's untimely death, contemporaries admired the Book of Hours, whose production must have cost a fortune, as a precious symbol of their deep affection. 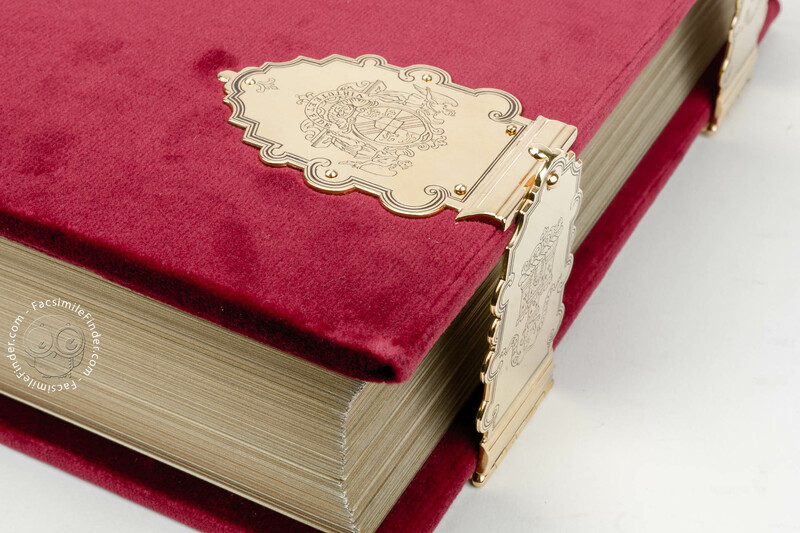 Red velvet binding including two gilded clasps that are additionally decorated with fine engravings, reproducing the arms and mottoes of the great English bibliophile Baron Harley. Manuscript book on parchment − 26 × 18 cm − 578 pp. 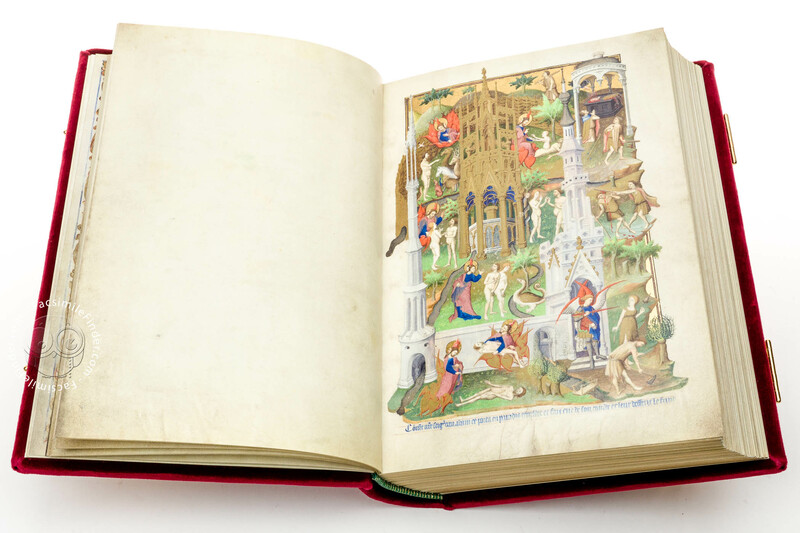 Full-size color reproduction of the entire original document, Bedford Hours: the facsimile attempts to replicate the look-and-feel and physical features of the original document; pages are trimmed according to the original format; the binding might not be consistent with the current document binding. 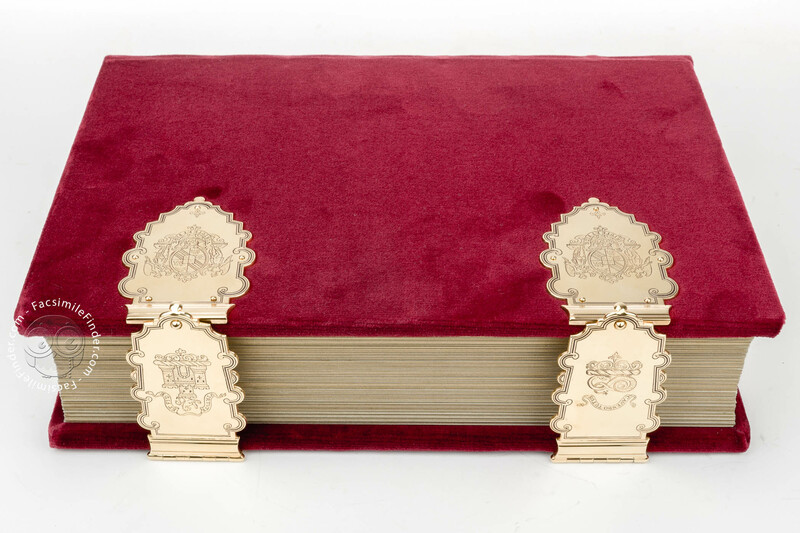 Red velvet binding including two gilded clasps that are additionally decorated with fine engravings, reproducing the arms and mottoes of the great English bibliophile Baron Harley. 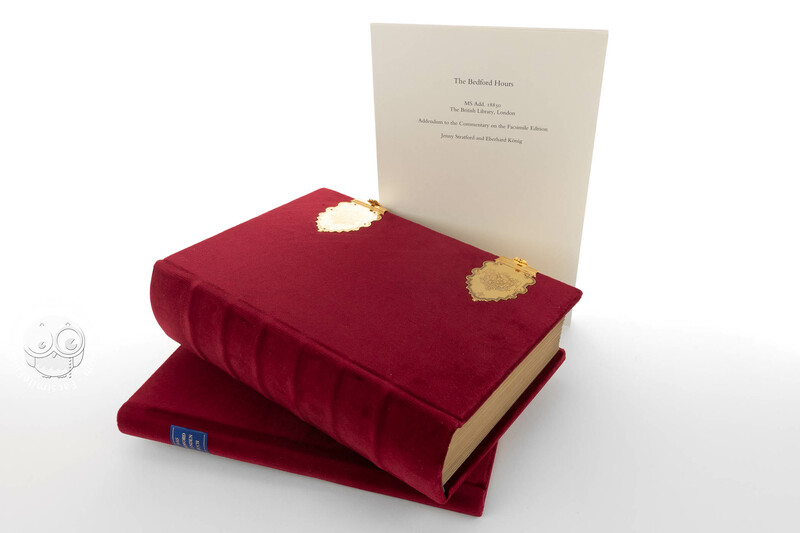 The contents binding with its hand-stitched two-colored head-cap is furthermore gilt-edged in a distinctive brush gold.